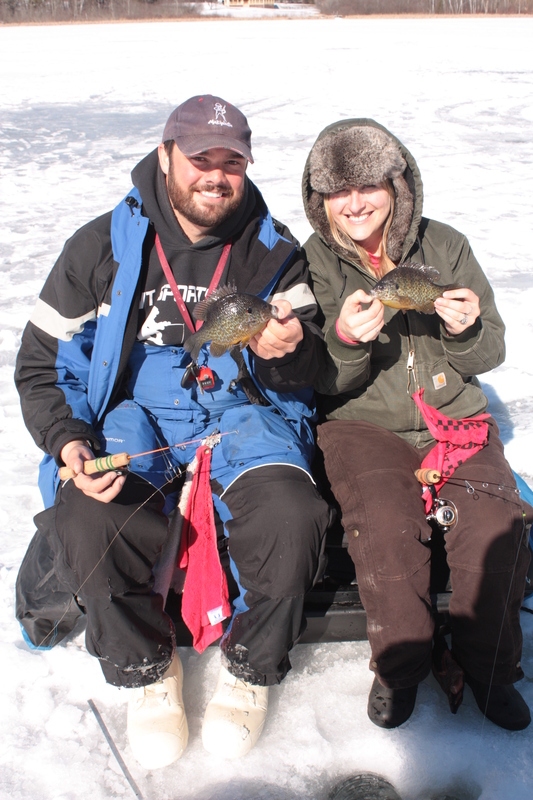 I made plans to take my girlfriend out for her first ice fishing excursion today being that it was a holiday. Two days before we went, we decided to cancel do to a weather forecast of temperatures in the low teens and winds in the high 20’s. Being that it was her first trip on the ice, I didn’t want to scare her off and waiting for a warmer day was a better idea. At the last moment, I told her that we were going and sitting in the shack would be sufficient being that we had found a good bite and moving wasn’t necessary. After running a few errands this morning, we were on the road. A friend was on his way there as well and looking to beat us by a few minutes. So far this morning, the day was gorgeous. The sun was bright and the winds weren’t all that strong. As we pulled up we saw my friend walking out past where we intended to fish. I flagged him down and got him to the spot. As we walked out he was already catching fish. I gave my girlfriend a full run through of all aspects of fishing today. The first lesson was punching holes. I opened up most of what we needed and then let her make a few herself. The second step was selecting a rod. Then a tutorial on tuning and fishing with a flasher and finally using an underwater camera to find structure and fish. The only part she didn’t need help with was catching fish. Before I even started fishing, she was catching her own. The fish were running big today and they were on the move. A tip up fisherman near us was running crazy chasing flags. Putting two and two together we figured that the predatory fish were the ones responsible for the movement. For a mid day bit we were having a great trip. The fish weren’t hunkered down in the weeds like normal and they were aggressive when they were below the hole. After a bit, the wind got to be too cold for Mary so I set her up in the shack. 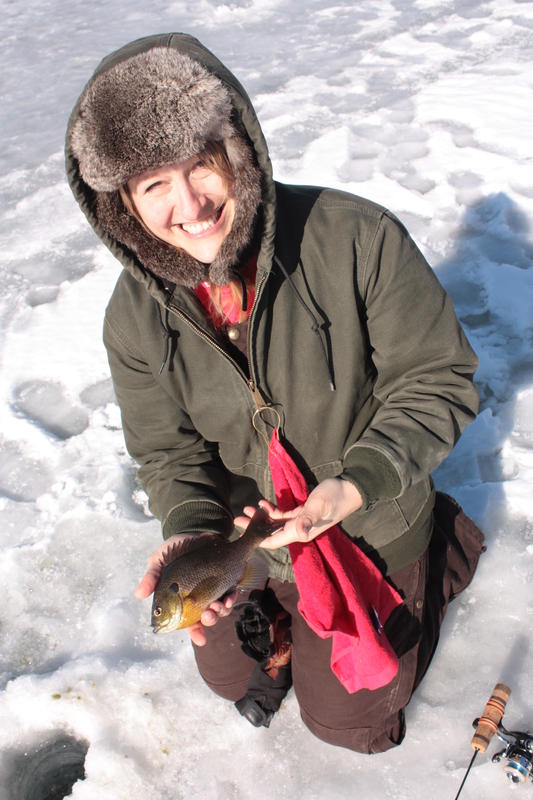 I punched a double hole so that she could sight fish. It was pretty funny to hear her excitement from outside the shack walls. We knew every time a fish swam through. Throughout the rest of the day she caught a bunch of fish. Pretty impressive for only being on the ice a few hours. At some point during the day, She said she saw a trout swim under her. We doubted it being so shallow and with a very limited population in the lake. Trout roam the deep water here and we figured it must have been a bass. Apparently her underwater fish ID is better than we had though. 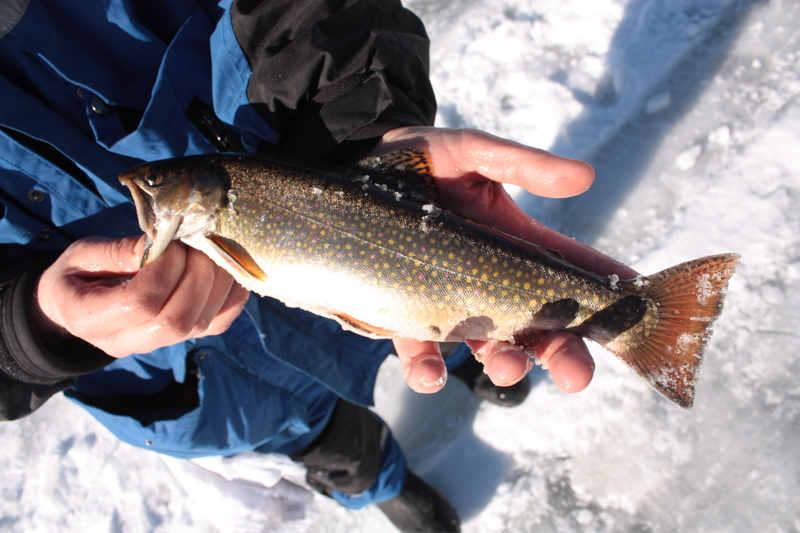 One of the last drops of the day for my buddy produced a vivid 13-14″ brook trout. A few quick pictures and back down the hole it went. Mary was happy with the trip and the only thing that took away from it was the wind. She plans to go again but on a warmer day! It was nice to finally get her out. I talk, write, and think about it enough to drive her nuts! Now she knows what it is all about!